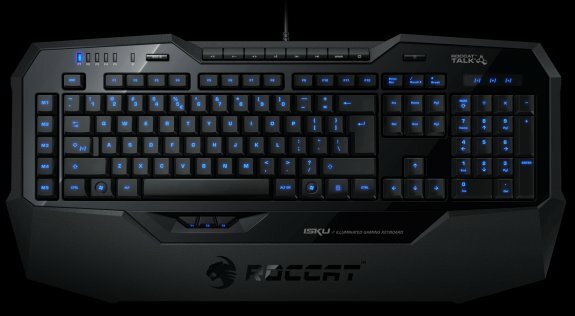 ROCCAT shows off the Isku Illuminated, a new gaming keyboard that will ship in early September for 79.99EUR. ROCCAT™ Studios is set to launch the ROCCAT™ Isku Illuminated Gaming Keyboard featuring new ROCCAT™ Talk and Easy Shift[+]™ technology. The exclusive ROCCAT™ Talk protocol allows the ROCCAT™ Kone[+] gaming mouse and the Isku to talk to each other – marking the first time a mouse and keyboard can operate in unison and opening up a wide range of unprecedented options for gamers. Being the world’s only keyboard to feature groundbreaking Easy Shift[+]™ technology, gamers can enjoy twice the number of functions for keys in the Easy Shift[+]™ Zone and can issue orders quickly and easily without ever having to re-adjust the hand position. In total, the Isku offers 180 easily-customizable macro functions strategically positioned in three locations in the simple-to-find WASD zone, including three freely-configurable Thumbster keys built into the Integrated Extra-Large Granular Wrist Rest. The ROCCAT™ Isku Illuminated Gaming Keyboard will be available at the beginning of September, 2011 for the MSRP of €79.99. This keyboard is packed with features – so please read the attached product release to learn everything about this outstanding gaming tool.